As stated, I’m not a fan. Not that I’ve never participated. In decades past, I’ve donned costumes and showed up as Jacob Marley, Cyrano de Bergerac, and Max Klinger, but in general, the Hallowe’en festival leaves me annoyed and out of sorts. There’s little an introvert like me enjoys less than having to sit around on tenterhooks, waiting, while strange children continually pound on the door, begging for candy and costume appreciation, while their parents provide overwatch from the shadows. Forced social interaction with a built-in judgment factor. The water of the spring seeps up from the ground, the source now collared by a ring of stone. Within the ring, the water is clear, but beneath the surface the stones are clad in the ochre velvet of accreted minerals. 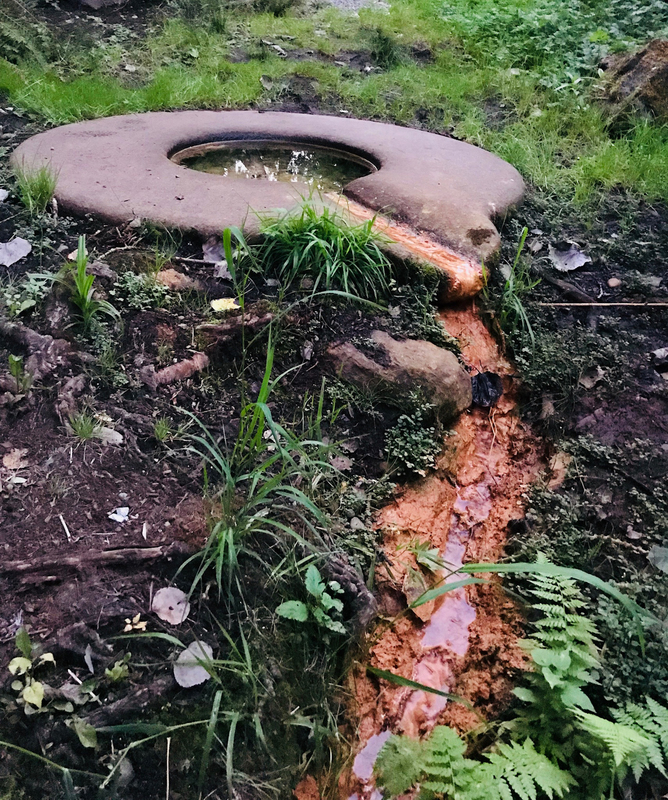 As the water gathers and flows quietly out the carved channel, the minerals oxidize, rusting, and paint the ground with a spill of red clay. The alluvial mud is slick to the touch, watery. For millennia, the People of the Inside and the People of the Large Lake came here to collect the wet, red earth, mix it with tallow, and make a bright, orange-red paint suitable for ceremonies and markings. The springwater trickles down the slope to join the creek that used to run down to Green Lake but which now, sadly, has been capped and diverted to a less salubrious destination. But for a short distance, as I walk the paths beneath the trees, it is still wild (in its gentle way) and free. I imagine it how it was, not so long ago, before the arrival of the Bostons (as the European-bred settlers were known). I can see thick-boled conifers, dark cathedral columns rising from the earth’s heart to hold up the red, sunset sky. Salal leaves, rough and leathery, grab at my shins, urging me to partake of their sweet, blue fruit. The breeze, wending its way past branch and fern, might taste of woodsmoke from a nearby camp. Frogs chorus in such numbers that, were I with a companion, we would not be able to hear each other speak. But we would not speak, for this is a place where words are unnecessary, where the thoughts of men are unneeded, and where our hand only diminishes what already is. As the sun sets and the birds of daylight sing their last, I know I have found an immortal place. To capture the passing year. Life in the grey and black canyons. The sky is a purple shell. Their branches garbed in orange and rust. The sound of butter in a hot skillet. Sizzle. Pop. Hiss. Flutter. Zing. And the sun lags behind me. Branches laden with sleeping birds. Beneath dark and bony boughs. The Pacific Northwest is in a tizzy today. Why? It’s gonna rain. Yes, it’s gonna rain, and it’s gonna rain good. We have a series of deep low-pressure cyclones heading our way, one of which is the remnants of Typhoon Songda, and the gradients are setting up to rival the historically massive Columbus Day storm of 1962: sustained winds (not gusts) of 50+ knots, 5–10 inches of rain in the mountains, flooding, power outages, The Works. These storms are going to wallop us from today to Sunday; already the heavy rains have begun. To prepare, yesterday we went out to get a few punkles of firewood. Our neighborhood is not prone to power outages, but this weekend may be the exception, so I thought it best to lay in a small amount of supplementary fuel. We drove up to WinCo, where they usually have a couple pallets of firewood out front. Nothing but pumpkins. Ruh roh. We went to Fred Meyer. Pumpkins. Central Market? Pumpkins. Safeway (yeah…right)…pumpkins. The world has gone pumpkin crazy. Hopefully the power won’t go out here or, if it does, not for long. We have a couple of punkles left over from vacation, plus a bin of scrap wood from old projects down in the garage. And there are some large branches in the back garden, trimmed and laid out as nurse logs, that I could chop up. We’ll be fine. Besides, these systems aren’t particularly cold, just wet and wild. I hope to take a walk in the teeth of it, to enjoy the fury and strength first-hand. See you on the far side. For as long as I’ve held an opinion on the matter, I’ve disliked oysters. My first experience with them was as a main ingredient in a casserole. It was a dish of unappetizing, crusty brown…something…dotted by pale, rounded, rubbery oblongs that smelled of smoke and tasted of oily tinned fish. I did not have a second experience. It’s a rule I have: Never take food from a guy who talks to himself. Call me crazy, call me cold and unfriendly, I don’t care. If you’re having an animated conversation with people I cannot see, I may have … reservations … about most anything you offer me. Thus the other day when Kevin (a guy I never met before) got off the bus behind me, talking a blue streak to no one in particular (he was not on the phone) and then, as we both walked toward the car park, asked me if I wanted a free bagel, I demurred. I mention this because Kevin then went on to tell me how he just doesn’t like people here in Seattle. We’re not as “friendly” as the people on the streets of his hometown, New York City. People here—according to Kevin—are cold, unfriendly, and not to be trusted. Leaving aside for the moment that “friendly” is not the word that immediately leaps to mind when I think of New Yorkers, this is not the first time I’ve heard Seattleites described as being as cold and unwelcoming as our weather. It’s an actual thing, and it’s called the Seattle Freeze. It is late October, early November, when Dawn puts on her grey scarf and each day arrives in soft focus, born in muffled softness. The edge of the world is only a stone’s throw away. Green needles and rusted leaves alike gleam in the moisture-laden air. Above, southbound geese call with muted trumpets, navigating the blanketed skies, seeking grey waters beneath grey fogbanks. All is cotton and wool, steely but soft, quiet and chilled, both bright and dim. I walk dew-slick streets, and feel that here, surrounded by these layers of mist, magic is possible. Enter your email address to join my minions and receive notifications of new posts by email.